Following hugely successful shows worldwide, Ireland’s AC Productions presents Samuel Beckett’s seminal play Waiting for Godot. Originally opening in 1955 at London’s Arts Theatre, in a production directed by Peter Hall, the revolutionary play returns to play limited performances through September 2017. Arguably the most famous play of the 20th century, Waiting for Godot follows two tramps, Didi and Gogo as they wait endlessly on a country road for a man named Godot. They don't know what time he will arrive, why he is coming or what he will do when he gets there. But they know that once he comes, they will be safe. And if he doesn't come, they will simply have to return tomorrow. Beckett's masterful work continues in the same vein, following Didi and Gogo as they pass the time with games, wordplay and existential questioning. Pozzo, a landowner, arrives with his slave Lucky. A boy comes and tells them Godot won't arrive today but may come tomorrow. They wait. And wait. And so it continues. From the writer behind plays including Endgame, Happy Days and All That Fall, Beckett is one of the legendary playwrights of the 20th century. 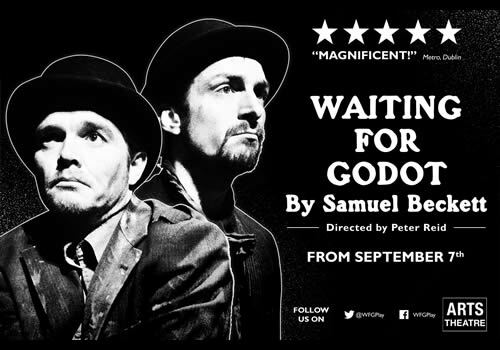 AC Productions' celebrated version of Waiting for Godot has toured the world for 10 years, and finally comes to the UK for the first time in September, playing at the venue it originally opened at. Directed by Peter Reid, Waiting for Godot plays at the West End's Arts Theatre from September 5th to September 23rd 2017. Waiting for Godot may not be suitable for young children. Click here for the Arts Theatre seating chart and seat price guide.